Brexit turmoil will continue, but how will it affect UK-China economic relations? When Britain voted in the 2016 Brexit referendum, there were many in Chinese media who naively thought, "Well, that is a democratic decision. Britain will leave the EU." However, critical issues in the West, as in other societies, are not decided by formal democratic processes but by power and money and the clash of powerful social forces. Therefore, the referendum did not resolve issues but unleashed the deepest British political crisis since World War II. British Prime Minister Theresa May's defeat in Parliament on her proposed EU agreement in mid-January was the largest government defeat in a vote since the 19th century, and possibly the biggest in British history. It is crucial for China to understand that the first forces active in the Brexit crisis are international - as failure to realize this led to misunderstanding in China. An argument sometimes heard in China is that if Britain leaves the EU it will become economically weaker, therefore it needs more Chinese investment, and will become friendlier with China. This is radically wrong - the more Britain leaves the EU the weaker it will become economically, but the more it will become hostile to China. The reason for this is that Britain is a large economy by most standards - the world's fifth largest at current exchange rates, and the ninth largest measured in purchasing power parities (PPPs) - but it is geographically wedged between the world's two largest economic units - the US and EU. Britain's economy is far too small to pursue a path independent of these two huge blocs and must, therefore, be subordinate to one or the other - or both. Before Donald Trump became US President, Britain did not have to choose between the US and EU - US strategy was that Britain would be its EU representative to help influence bloc policy. When US president Barack Obama was in office he openly campaigned for Britain to stay in the EU. But Trump reversed that policy. Trump considers that the economic size of the EU can be used to protect individual European countries from submitting to US economic and geopolitical demands. Trump therefore deliberately set out to weaken, and if possible, break up, the EU. By aiming to take Britain out of the EU, Trump would undoubtedly economically damage the UK - as Britain would potentially be weakened by tariff barriers to its largest market. But that is not important to Trump. On the contrary, it would be welcome as it would make the UK less capable of resisting US economic and political demands. Trump's support for Brexit is, therefore, part of his "America First" strategy, that other countries should pass economic resources to the US even at the expense of their own economies. This policy's central goal is to strengthen the US so it can confront China. The strengthening of pro-Brexit forces in Britain would mean a greater UK subordination to the US. While Britain would become economically weaker the more it separated itself from the EU, it would not make it friendlier with China - on the contrary, it would make Britain more subordinate to the US, and therefore more hostile to China. This dynamic may be grasped from the opposite viewpoint. The "golden period" of China-UK relations was under former British prime minister David Cameron, who led the Tory Party's anti-Brexit wing. Cameron had a clear strategy: Britain would be China's key economic gateway into the EU. This was logical and had a chance at success. London is the most important financial center in Europe and English is the main foreign language for Chinese companies. This combination made Britain an attractive location for China's companies expanding into the EU. This is why, for example, in addition to close political relations, Cameron was friendly with companies like Huawei. But Trump does not want China's companies to enter the European market. Therefore, he both openly supported Brexit and has worked to block companies like Huawei from playing a role in Britain's telecommunications industry. The theoretical framework of China's reform and opening-up, with its orientation to the international market, leads to the opposite conclusion - that Britain should maintain its EU membership. This overall position is in addition to China's own specific interests. 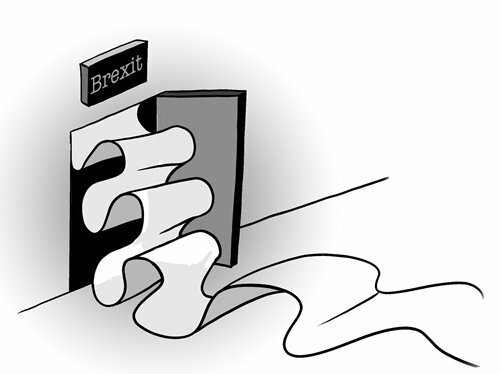 The present Brexit crisis is advantageous for China compared to the alternatives. In Britain itself a new word has been created, BRINO - Brexit In Name Only. The development most favorable for China is the "softer" the Brexit the better, or to put it in pejorative terms, the more Britain becomes a "vassal state" of the EU. If Britain did not exit the EU there would be no essential change from the present situation - Britain would be a good point of entry into the EU. If Britain carries out a BRINO, like a wounded animal, it will have suffered a self-inflicted injury - which will strengthen the bargaining position of Chinese companies and China as a whole.